Scientific Name(s): Iris japonica Thunb. Photographer(s) Appreciation: A beautiful photo of Iris japonica courtesy of Christopher aka c.young@Flickr via the Botany Photo of the Day Flickr Pool. Thank you! Aptly named “butterfly flower” in Chinese for its appearance, Iris japonica is native to Japan, Myanmar (Burma) and China. Other common names for this species include fringed iris and shaga. Iris japonica grows in wet grasslands, rocky slopes, woodland hills, and open forests margins. Through most of its range, fringed iris grows at elevations of 500-800m (1650-2625 ft.). However, in southwestern China, the species flourishes at 2400-3400m above sea level. There is speculation that these high altitude plants may be naturalized from introduced plantings. Fringed iris was scientifically named and described in 1784 by a Swedish physician and botanist, Carl Peter Thunberg. Eight years later, the species was introduced into European cultivation by Thomas Evans (who worked with the East India Company). Now widely cultivated, this iris species is naturalized in many temperate parts of the world. Blooming in late spring to early summer, this evergreen perennial makes a dense carpeting groundcover. Both rhizomatous and stoloniferous are used on various web sites to describe how the species spreads vegetatively, but rhizomatous is likely the better term as the horizontal stems are root-like. The 2-4 flowered inflorescence stands erect above a fan of glossy, sword-shaped basal leaves, reaching somewhere between 25 to 50cm tall (to 20 in.). In Japan, this iris was encouraged or planted on the tops of hills, within castles, the slippery fans of the iris leaves were used to slow marauding invaders to allow defending armies to protect the castle. In Chinese herbal medicine, the rhizomes are used in a decoction to treat some maladies such as swelling, bronchitis, rheumatism, and some internal injuries. The rhizomes can also be used as a source of starch, but caution is required as this (and other species of Iris) are generally considered to be poisonous (including the rhizomes) without proper preparation. I love this plant, had it, and shared it for about 30 years. on the Oregon Coast. The flowers bloom sequentially up the stem, and are wonderful cut flowers. Also, the Iris confusa has a similar flower though infused with a lavender basic color. Slugs can be a minor problem, both on the foliage and flower. I have also grown I. japonica, but not such a lovely color form. Wonderful. 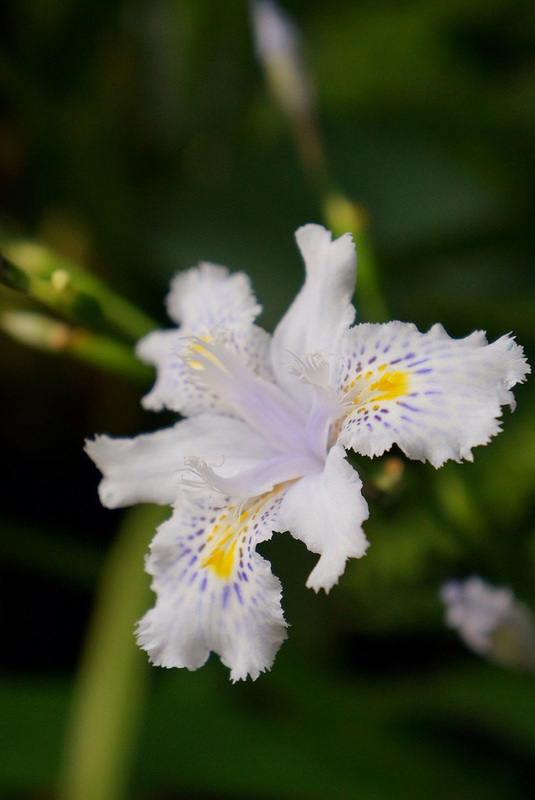 Also in Chinese medicine Iris japonica is one of the three species of Iris (with Iris tectorum and Iris dichotoma) used as adulterants of the much-used Iris domestica (though still usually known as Belamcanda chinensis), shè gān. Iris domestica was known in old herbals as the gold butterfly flower and crow fan. How delightful to meet a plant used defensively for it’s leaves not its poisons. I shall have to plant some along my farm lane to keep naughty interlopers at bay. In Japanese, this plant (or maybe a similar one? Iris ensata or Acorus calamus?) is called shobu. It is homophonous with the word for a fight or a match. This combined with the sword-like appearance of the leaves makes for lots of puns in Japanese.